Sailboat and anchor atop an ocean of blue. With red, white and powder blue accents. 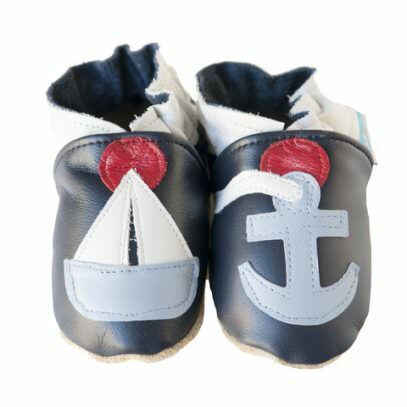 Cade&Co shoes feature a leather, slip-on shoe design recommended by pediatricians for babies and pre-walkers. 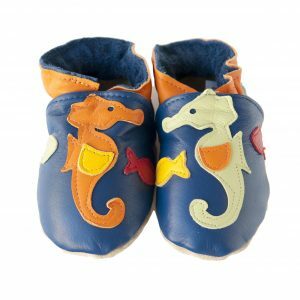 The natural suede sole provides protection while allowing babies and toddlers to feel the ground beneath their feet as they learn to stand and step. The comfortable, ultra-soft, breathable leather keeps feet cool in summer and warm in winter. The natural suede sole helps protect against slipping. Founded in 2003 by a mother of two boys, Cade&Co develops products with original and creative designs. Each is individually made with care in America. 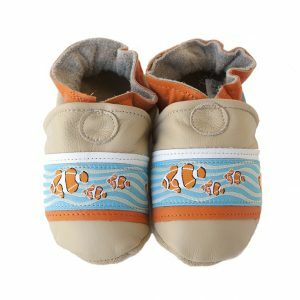 Our Goal is to provide a high-quality, practical line of children’s shoes that parents, babies and children can use and enjoy everyday. Shoes: If preferred, shoes can be machine washed, but for best results, hand wash in cool water with a mild soap. Roll in paper towel to remove excess water, air dry. A leather lotion may be applied (not to suede sole) to restore luster if desired. USPO First Class Mail with tracking. Use Product Enquiry for quote with shipping to countries not listed already listed. Return within 30 days for credit to creditcard.